The CIA mounted an ambitious tunnel-digging operation in 1954 to tap into Russian communications lines beneath Berlin. No sooner had the last shot of World War II been fired than a new, different kind of conflict began. With the defeat of Nazi Germany, old alliances were laid to rest and new ones emerged. In the early 1950s, the Soviet Union developed the atomic bomb (with access to stolen American documents), and the United States, North Korea, and China squared off in a bloody stalemate on the Korean Peninsula. The focus of East-West espionage centered on Berlin, the prize objective of the Allied armies in the closing days of World War II. In the now divided city, both sides tried to gain the upper hand. In 1954, the Central Intelligence Agency began a high-risk operation called Operation Gold, a daring plan to tap communication lines running from western France deep into the heart of the Soviet Union and Eastern Europe. Thus began one of the most audacious espionage operations of the early Cold War period—the celebrated Berlin Tunnel episode. The genesis of Operation Gold occurred in 1948, in Vienna, Austria. Like Berlin, Vienna was a hotbed of espionage in the years immediately after the war. Also like Berlin, Vienna was divided into four military zones operated by Great Britain, the United States, France, and the Soviet Union. The British had an avid interest in learning as much about Soviet communications in Vienna as possible and sent one of their top agents, Peter Lunn, to investigate. Lunn found out that the Soviets were using Austrian telephone lines to link Soviet military headquarters in Vienna to Moscow. He also discovered that all communications from Moscow to its military nerve center in Austria came through the Imperial Hotel, using trunk lines in the suburb of Schwechat. The British secret service wing, MI6, bought a building near the site, paved it with reinforced concrete, and dug a 70-foot tunnel from the building’s basement to the cables. The scheme was codenamed Operation Silver. In order not to attract unwanted Soviet attention, MI6 opened a cover business, a Harris Tweed import company, to conceal its real purpose underground. Much to MI6’s delight, the business thrived, thus allowing the spies to do their covert work undetected. In time, the British shared their findings with the CIA, and the two sides worked in tandem in sharing the intelligence bonanza that poured forth from their mutual undertaking. From the phone taps, MI6 was able to learn the Soviet Union’s order-of-battle strategy and to keep up to date on high-level military plans emanating from Moscow. The success of Operation Silver, which ran from 1948 to 1952, was the model used a few years later by the CIA in its audacious Berlin tunnel undertaking. With the partition of Berlin after World War II, the United States moved its military headquarters into the bombed-out city in July 1945. The American section was adjacent to the British zone of control in the area of Berlin known as Zehlendorf. From a sprawling residence there, the CIA, using the cover name BOB (Berlin Operating Base), began operations. Berlin was also the main target of Soviet intelligence operations. The Russians reigned with an iron fist in their zone of influence, targeting the United States in particular and mounting a large-scale intelligence-gathering operation that included informers, double agents, and other people of interest in the city. The CIA ran two of its most important divisions at BOB—the secret intelligence branch and X-2 counterintelligence. If anyone was going to beat the Soviets at their own game in Berlin, it would be these two units. As the BOB operations took root, they expanded into fields other than the usual acquiring of military intelligence. BOB agents concentrated for some time on the economic goings-on in the vast Soviet-controlled sectors of the city. Through the use of informers and other secret assets, BOB was able to penetrate the headquarters of Soviet intelligence in Berlin, which was located at Karlshorst. One of BOB’s most important successes was tracking the development of the Russian atomic bomb in the late 1940s. It reported to Washington that the Soviets were in the process of mining uranium ore, a vital component in the construction of a bomb. Soviet mole George Blake was imprisoned in England for espionage but escaped and made it to Moscow, where he received a hero’s welcome. The U.S. Army also played a large part of the BOB operations, providing logistical and transportation facilities in Berlin. BOB worked directly under the Theater G-2 (Intelligence) group under the command of General Edwin Sibert. In time, BOB was to become the largest intelligence collection agency in Europe and was instrumental in keeping Washington abreast of the situation during the Berlin blockade in 1948. BOB was in a unique position to lend its critical expertise when the plans for Operation Gold began. Drawing on the success of the Vienna operation, the top echelons of the CIA began a detailed study on how to duplicate the British feat, this time right under the noses of the Russians and their East German allies in Berlin. After an exhaustive study by the best scientific minds in the CIA, it was decided that the most obvious way to attack the problem was to concentrate efforts on the underground cables buried beneath the city. CIA scientists had come to realize that the cables could not be monitored by listening posts above ground. But if taps were placed below ground, chances of them being detected were slim. To test this theory, a CIA double agent in 1953 placed a tap on the East Berlin telephone exchange, patching into local phone lines to West Berlin when no one was looking. The tap proved so successful (it was never discovered) that the CIA decided to proceed with Operation Gold. Throughout 1953, a full scientific effort went into all aspects of the plan, with every possible scenario being played out. When research was complete, the final plan was sent to the desk of CIA Director Allan Dulles for final approval. Dulles, an old OSS spymaster during World War II, knew a good thing when he saw one and decided that the plan was worth pursuing. He gave it the go-ahead, and the largest CIA covert operation of the Cold War got under way. After careful study by BOB agents, it was decided that the best place to begin the digging was in the Altglienicke district of Berlin. Work began in February 1954, with the CIA using as its cover the construction of an Air Force radar site and warehouse. The Soviets were always monitoring the CIA’s activities in Berlin, but they took no particular notice when the Americans began constructing the building; the Soviets thought it was just another military installation. The CIA decided to brief the British on Operation Gold. In retrospect, it was a terrible idea. 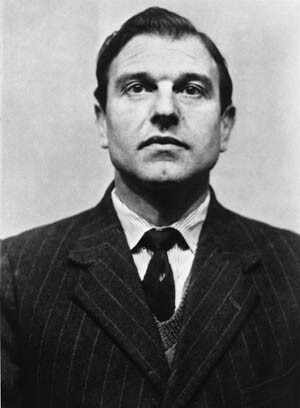 One of the British intelligence officers who took part in the briefing, George Blake, was a Soviet mole. Blake took extensive notes, and immediately after the meeting he reported what he had learned to his case officer, Sergei Kondrashev. The Soviets had a choice to make. The man the CIA selected to run Operation Gold was a James Bond-like officer named William King Harvey, a swashbuckling agent who carried a gun with him at all times. Harvey originally had worked for the FBI, but after an altercation with Director J. Edgar Hoover he left the Bureau for the CIA. Harvey was legendary for the amount of liquor he absorbed before lunch and was wary of anyone who did not follow his hard lifestyle. He found the newly created CIA more to his liking and wound up in Staff C, the agency’s counterintelligence wing. One of his early duties was to unmask the top Soviet mole, Kim Philby, who worked for the British Intelligence Service in Washington, D.C. In 1952, Harvey was given the sensitive post of CIA station chief in Berlin. Since it was virtually impossible for any BOB agents to penetrate into East Germany, Harvey secretly recruited a number of double agents who worked for the East Germans, especially those in the communications areas. Whenever these spies ventured westward, they carried with them vital information on the communications setup of the East German government. One of Operation Gold’s most important double agents was an unnamed source called “Sniper,” who relayed information to BOB regarding Soviet penetration of Western interests in Berlin. Harvey divulged the particulars of Operation Gold to only a handful of men at the BOB, an information control system known in spy terms as compartmented information. He even kept the secret of the tunnel from Robert Murphy, who became BOB’s second in command in 1954. Harvey briefed Dulles about the progress of the tunnel operation, and Dulles gave the go-ahead. After secret meetings with British intelligence in London, work began on the tunnel a year later. The U.S. Army Corps of Engineers began the job of digging into the ground in the eastern sector of Berlin occupied by the Russians. The British were responsible for building a vertical shaft that connected to Soviet telephone cables. Before the tunnel was actually built, the Corps of Engineers made a duplicate tunnel in the New Mexico desert, using the same dimensions as the one proposed in Berlin. Harvey even fooled the mayor of West Berlin, telling him that the engineers were merely doing some geological work beneath the city because the Allies feared the Russians might try to destroy the Berlin sewer system. Construction of the tunnel was a mammoth undertaking. The tunnel extended 1,476 feet beneath sandy soil and reached a cable approximately 27 inches beneath the ground near the end of a busy highway that was used by East German and Russian forces. The American workers responsible for digging the tunnel arrived on August 28, 1954, but the next month they hit a snag when diggers struck water. High-powered pumps had to be brought in to clear the mess. The tunnel digging ended on February 28, 1955, and it took construction workers another month to finish the job. When it was finished, the tunnel went 500 yards underground, right to the Soviet border, and another 500 yards to the area containing the main Soviet switching cable facility. The tunnel was made up of interconnected sections. Three prefabricated rooms were built to house the men monitoring the underground post, and air conditioning systems were installed to provide them with minimum creature comforts. Each chamber had a metal door that sealed it off from the rest of the tunnel. The first taps were installed in May 1955. Tapping into the Soviet lines was a complex undertaking that lasted into August. Then the underground agents went to work. 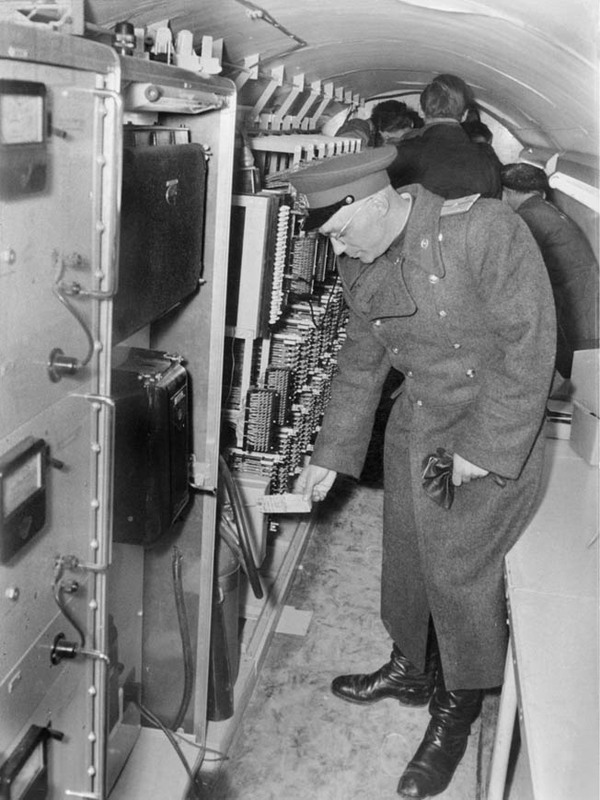 A Soviet officer shows reporters CIA electronic monitoring equipment during a press conference revealing the existence of the tunnel. At the height of the tunnel operation, American listeners were able to monitor over 500 connections at the same time, over 121 voice circuits, including over 4,000 feet of teletype. By the time Operation Gold ended, the CIA had eavesdropped on some 50,000 reels of tape, monitored 443,000 fully transcribed conversations between the Soviets and East Germans, accumulated 40,000 hours of telephone conversations, and gathered 1,750 intelligence reports. “Harvey’s Hole,” as the tunnel process was dubbed, was an intelligence bonanza for the West. The CIA recorded every important political and military conversation emanating from East Germany to all Soviet outposts across Europe. According to the CIA’s later investigation of the tunnel affair, British double agent George Blake had alerted the Soviets of Allied plans for the tunnel prior to his departure from Berlin in early 1955. The Soviets were faced with either stopping a potentially harmful operation or losing a valuable penetration agent. They chose to protect their source and allowed the tunnel to operate unimpeded from May 1955 to April 1956, when the Soviet maintenance crew “accidentally” found the tunnel. Blake was later arrested and sentenced to a 42-year prison term but made a daring escape from the heavily fortified Wormwood Scrubs prison in England in 1966 and found his way to Moscow, where he was treated as a hero. The Berlin tunnel operation was the first major Cold War covert action project the CIA would mount; it would not be the last. For his part in the operation, William Harvey was presented with the Distinguished Intelligence Medal in a secret ceremony officiated by CIA Director Allan Dulles. Some things are best kept hidden—even well-deserved awards. Tags Allan Dulles, Berlin Airlift, Berlin Tunnel, CIA, Cold War, East Berlin, East Germany, Eastern Europe, espionage, George Blake, Germany, MI6, Operation Gold, Soviet Union, U.S. Army Corps of Engineers, William King Harvey.